Abstract SCIAMACHY on-board ENVISAT is measuring solar irradiances and Earthshine radiances from the UV to the NIR spectral region in nadir, limb, and lunar as well as solar occultation geometry. Solar occultation measurements are performed in Sun-scanning mode during sunset at northern latitudes between 49°N and 69°N, depending on season. The radiative transfer and retrieval code SCIATRAN2.1 is used to derive vertical profiles of ozone and NO2 from the SCIAMACHY solar occultation measurements. The retrieval scheme is an optimal estimation approach with Twomey-Tikhonov regularization. Ozone and NO2 are simultaneously retrieved in the fit windows 524-590 nm and 425-453 nm, respectively. Here we present an almost complete dataset from August 2002 to August 2007, including validation results with independent measurements from the satellite instruments HALOE and SAGE II. SCIAMACHY (SCanning Imaging Absorption spectroMeter for Atmospheric CHartographY) is a passive remote sensing moderate-resolution imaging UV-Vis-NIR spectrometer on board the European Space Agency's (ESA) Environmental Satellite (ENVISAT). ENVISAT was launched in March 2002 from Kourou, French Guiana to a Sun-synchronous orbit with an equator crossing time in the descending node of 10.00 am. 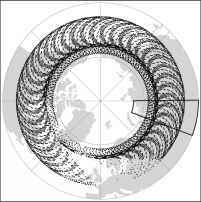 The instrument observes the Earth atmosphere in nadir, limb, and solar/lunar occultation geometries and provides column and profile information of atmospheric trace gases of relevance to ozone chemistry, air pollution, and climate monitoring issues (Bovensmann et al. 1999). to a sunset event. The scan sequence is as illustrated in Fig. 2: In an initial phase, SCIAMACHY scans around 17.2 km above the horizon, waiting for the Sun to appear. 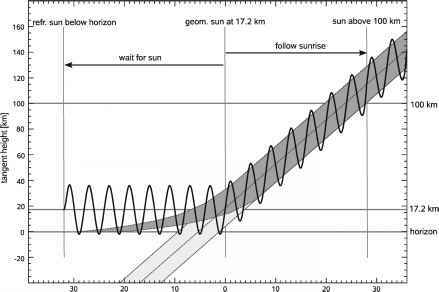 When the Suns geometrical altitude exceeds 17.2 km, the instrument follows (continuously scanning) the rising Sun up to an altitude of about 300 km. The field of view (FOV) of SCIAMACHY in horizontal direction is 1.8°. In case of solar occultation a small aperture to reduce the amount of incoming light is put into the light path and reduces the FOV to 0.72°. In vertical direction, the FOV is 0.0045° corresponding to an altitude range of about 2.5 km at the tangent point. With measurements performed every 62.5 ms, 16 spectra are taken during one sweep of 0.72° over the solar disk. 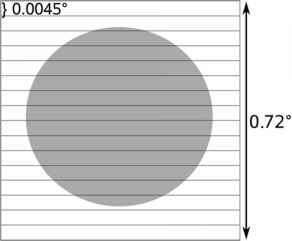 The solar disk with a diameter of 0.53° is completely covered, as illustrated in Fig. 3. Only directly transmitted light contributes significantly in occultation geometry. Transmissions are calculated dividing atmospheric measurements by an appropriate measurement from above the atmosphere. In southern latitudes (40°S-90°S) SCIAMACHY performs lunar occultation measurements, depending on visibility and phase of the Moon (Amekudzi et al. 2005). 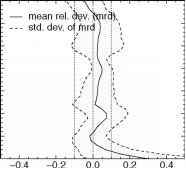 The SCIATRAN version 2.1 radiative transfer code (Rozanov et al. 2005) is used for forward modeling and retrieval. An optimal estimation approach with Twomey-Tikhonov regularization is used to fit simultaneously NO2 and ozone in the spectral windows of 425-453 nm and 524-590 nm respectively at the spectral resolution of the SCIAMACHY instrument, which is 0.44 nm for these windows. The SCIAMACHY ozone and NO2 cross sections are used (Bogumil et al. 2000). Ozone profile a priori information is taken from the Fortuin and Kelder ozone climatology (Fortuin and Kelder 1998). An NO2 climatology has been compiled from HALOE sunset measurements from 1992 to 2005. Broadband absorption features of the atmosphere and broadband instrument effects were removed from the measured spectra by subtracting a third order polynomial. Precise tangent height information is derived geometrically using the Sun as well-known target in space (Bramstedt et al. 2007). From the 1040 spectra taken in one occultation measurement sequence, a set of 11 spectra taken around the center of the solar disk between 12 km and 45 km is selected. One measurement well above the atmosphere is used as reference to calculate the Sun-normalized transmission spectra. The theoretically calculated errors for the retrieved profiles are for ozone between 17 km and 48 km below 2% and for NO2 between 23 km and 38 km below 4%. However, these values do not recognize systematic errors (such as calibration errors in the spectra) and are influenced by the amount of regularization applied in the retrieval. The Halogen Occultation Experiment (HALOE) was launched on the Upper Atmosphere Research Satellite (UARS) spacecraft in September 1991, operations were stopped in November 2005. For this work, ozone and NO2 profiles from version 19 of the HALOE data are used. The Stratospheric Aerosol and Gas Experiment II (SAGE II) was launched on the Earth Radiation Budget Satellite (ERBS) in October 1984 and stopped operation in August 2005. The current version 6.2 is used for the comparisons. Both instruments also measured in solar occultation mode. 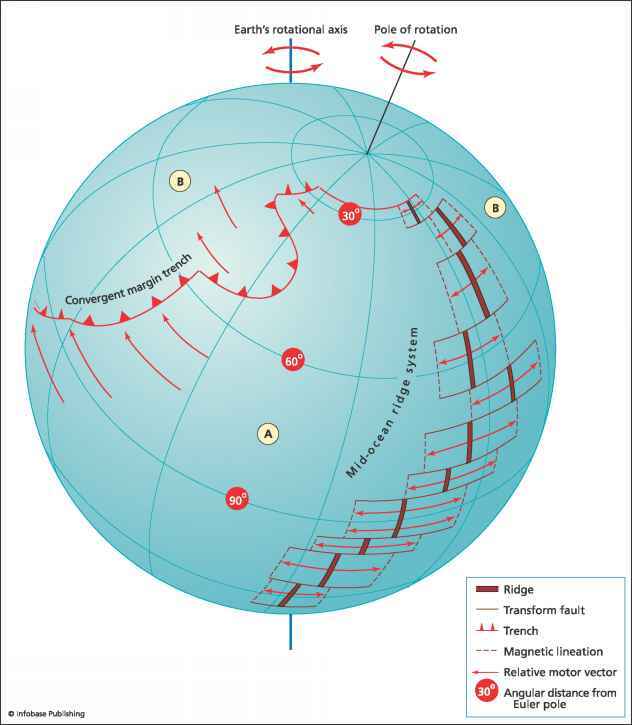 For the study presented here, all coincidences within 500 km distance between the tangent points and with no more than 6 h between the measurements are used. Because of the diurnal cycle of NO2, the coincidences NO2 are restricted to sunset events of HALOE and SAGE II. Due to the strict coincidence criteria, most of the matches are sunset events anyway. 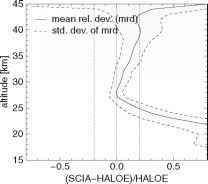 Figure 4 shows the mean relative deviation (mrd) and the standard deviation of mrd of the SCIAMACHY ozone profiles compared to HALOE and SAGE II. There is a remarkable good agreement with less than 10% mrd from 17-50 km. In general, SCIAMACHY gives slightly higher ozone values in the order of 5% for most altitudes. Figure 5 shows the same plots for NO2. The comparison with SAGE II shows good agreement from 18-40 km with mrd below 20% and a bias of about 5%. The comparison with HALOE gives mrd below 20% only above an altitude of 24 km, below the HALOE profiles give much smaller values. NO2 has a strong gradient along the line-of-sight in case of occultation geometry, because its concentration changes rapidly during sunset (and sunrise). Therefore, the measured NO2 value is not completely representative for the solar zenith angle of 90° at the tangent point, especially at lower altitudes. The HALOE retrieval recognizes this and performs a correction to get profiles representative for 90° solar zenith angle (Bracher et al. 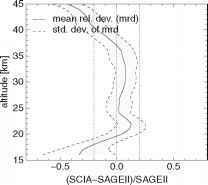 2005), whereas for SCIAMACHY and SAGE II no such correction is done. This might explain the larger deviation to HALOE at lower altitude and has to be further investigated. About 19000 solar occultation measurements from the begin of measurements in August 2002 until August 2007 have been evaluated so far. Figure 6 shows a time series of the vertical ozone distribution from SCIAMACHY's measurements (one profile per day over Siberia, see Fig. 1). Figure 7 is the equivalent time series for NO2. in latitude. From May to November, ozone concentrations as expected for mid-latitudes in summer and autumn are observed. From December to April, the measurements at higher latitudes are influenced by the development of the Arctic ozone hole. In 2003, 2005, and 2007, higher ozone loss in the Arctic ozone hole season than in the years 2004 and 2006 were observed. Also the NO2 time series is dominated by the variation in latitude over the year. At higher latitudes from October to February, low concentrations are observed, whereas at mid-latitudes increased NO2 values are observed. 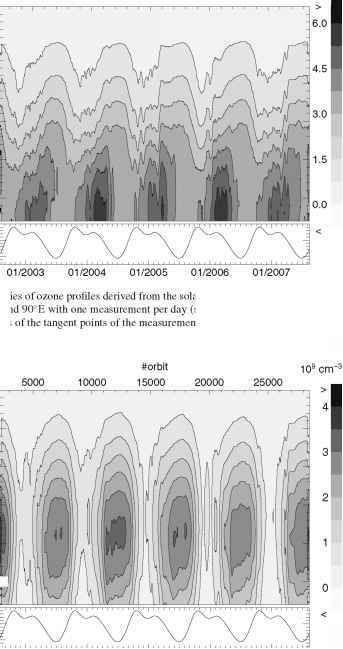 SCIAMACHY solar occultation gives ozone profiles of excellent quality, and NO2 profiles of good quality in the Northern Hemisphere as shown by comparison with co-located measurements of HALOE and SAGE II. An almost complete dataset of ozone and NO2 profiles from 5 years in orbit is presented. With the extension of the mission until 2013, which is under investigation by ESA at the time of writing, SCIAMACHY solar occultation will continue the long term datasets of previous solar occultation instruments such as HALOE and SAGE II and contribute to a better understanding of atmospheric chemistry and dynamics in the Northern Hemisphere. The presented data are available upon request from the first author. Acknowledgements We thank the European Space Agency (ESA) for providing SCIAMACHY level-1 data, the HALOE team (at Hampton University, especially J. M. Russell III, and at NASA LaRC, especially E. Thompson), and the SAGE II group (at NASA LaRC, especially Larry Thomason and the NASA Langley Radiation and Aerosols Branch) for providing data and information from their instruments. This work was funded in parts by the German Ministry of Education and Research (BMBF) via grant 07UFE12/8, the DLR-Born via grant 50EE0502, the University of Bremen and the state of Bremen.